"Last night at 3.30 am there were too many mosquitoes, so I used HIT (repellant). Now should I start counting how many mosquitoes I killed or should I go back to sleep?" VK Singh, a former Army Chief, posted in Hindi. Union Minister VK Singh took a swipe at the opposition over the Balakot air strike death count. Union Minister VK Singh today said those raising questions on the Balakot strike "should be tied to the aircraft and taken along the next time", doubling down after a tweet in which he used a "mosquito-killing" metaphor to target opposition parties. "Next time when India does something like that, I feel that those who raise questions should be tied under the aircraft and taken along. When the bombs are dropped, they can see the targets and after that they can get off, count the casualties and come back," VK Singh told news agency ANI. In his tweet this morning, the Union Minister had written: "Last night at 3.30 am there were too many mosquitoes, so I used HIT (repellant). Now should I start counting how many mosquitoes I killed or should I go back to sleep?" Though there was no mention of the February 26 Indian Air Force strike on a Jaish-e-Mohammed camp in Pakistan, the inference was not lost on anyone. Explaining his tweet, VK Singh said: "Do you count things? Bombs were exploded, buildings were hit and will people not be killed after an explosion of a 1000-kg bomb? If killed, then you make an estimate of number of people killed. I don't know who wants to count it. It's unfortunate." Yesterday, Haryana minister Anil Vij, had made similar comments in his tweet: "The next there is a strike on Pakistan-based terrorists, then one of mahagathbandhan (opposition grand alliance) leaders should be made to stand there so that they can count the bodies." The opposition has been prodding the government to spell out an official death count in the Balakot strike amid international media reports - many quoting Pakistani locals - questioning the impact of the IAF operation. On Tuesday, Defence Minister Nirmala Sitharaman refused to confirm a casualty figure. "The foreign secretary gave the statement; that is the figure," she said, referring to the briefing by Vijay Gokhale the day the air strikes took place. The Foreign Secretary had not given any figure either; he had said a "very large number" of Jaish terrorists, trainers, senior commanders and groups of jihadis being trained for suicide attacks in India were eliminated when IAF jets bombed the largest training facility of the terror group responsible for the February 14 attack in Kashmir's Pulwama in which over 40 soldiers were killed. Home Minister Rajnath Singh came closest to validating an unofficial figure of "300" circulating on the day of the strike. 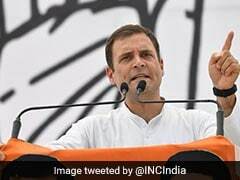 He said the Congress was not willing to accept an assessment by the National Technical Research Organisation that said some 300 mobile phones were active at the Jaish-e-Mohammed camp before the Air Force's Mirage 2000 fighter jets bombed it. While the government has not given any figure, BJP president Amit Shah claimed at a political rally that over 250 terrorists were killed, provoking opposition digs. VK Singh had said it was not a confirmed figure but an estimate.